BOCA RATON – Juggling his line once, maybe twice, in a four-day span isn’t the way FAU offensive line coach Garin Justice would have preferred to spend the week leading to the season opener. It wasn’t totally unexpected, either. “It’s the life of college football,” Justice said. Matt Weiner may be the latest Owl to move into a starting spot on an offensive line that, when fall camp ended last week, had appeared to have emerged powerful and injury free. Weiner spent the final portion of Tuesday’s and Wednesday’s practice working with the first team at right guard – a spot usually occupied by Antonyo Woods. FAU coaches weren’t discussing Woods on Wednesday and didn’t rule out the redshirt junior’s return to his starting spot before Saturday’s game against Southern Illinois. Released on Wednesday afternoon, FAU’s first official depth chart, which only featured the Owls starters, listed Wood at right guard. “I’m always hopeful,” Justice said. A walk-on, 6-foot-4, 275-pound redshirt-sophomore, Weiner spent much of fall camp at tackle but he’s also worked on the interior of the line for FAU. Offensive coordinator Travis Trickett indicated that Weiner earned the moniker “Wein-Dog” in part because of his rabid focus. “You never know when he’s happy because he always looks mad,” Trickett said. Earlier this week FAU shuffled three other players along the line to compensate for the loss of left tackle Reggie Bain, who was seriously injured in a motor scooter accident on Friday and is expected to miss the season. Starting center Dillon DeBoer, natural tackle, moved outside to fill Bain’s spot. Roman Fernandez, who was slated to be the starting center last season before concussion-like symptoms in the final week of camp ended his season, is moving from starting left guard back to center. The Owls promoted redshirt freshman Tarrick Thomas to the starting left guard spot, filling the void left by Fernandez. If Woods doesn’t return to the lineup, left tackle Kelly Parfitt would be the only FAU offensive lineman starting in the same position he was playing when fall camp ended last week. “It’s different but I’m sure everything is going to work out fine,” Fernandez said. 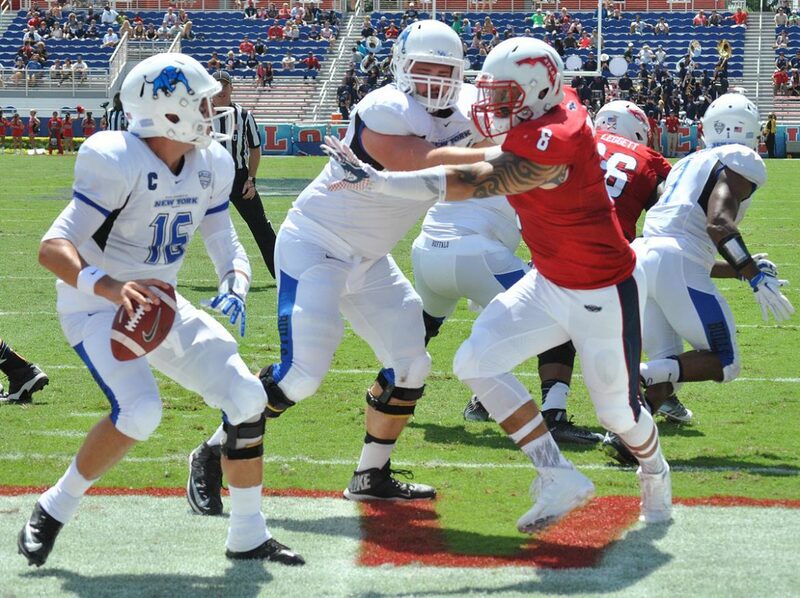 BOCA RATON – FAU coach Charlie Partridge recognizes this version of Nick Internicola. Called “tenacious” by Partridge, Internicola missed all of spring while recovering from a leg injury that hampered him most of last season. This August, though, Internicola is healthy, which is allowing him to perform like the player Partridge remembers. Other coaches are taking notice. A redshirt junior, Internicola began his college career at Rutgers before transferring to FAU prior to the start of the 2014 season. Last season Internicola played in every game, recording 23 tackles – two of which were sacks. He’s also on the scoreboard, recording a safety by forcing an intentional grounding penalty in the end zone against Buffalo last season. Scoring points is something that Internicola has over Trey Hendrickson, Conference USA’s Preseason Defensive Player of the Year who lines up on the opposite side of the line from Internicola. And, yes, Hendrickson admits that makes him a little jealous. Like his coaches, Hendrickson sees a different level of play from Internicola this fall – one which has frequently allowed the duo to meet the at the quarterback. He’s also climbing the depth chart. Hunter Snyder entered fall camp as the starter at left defensive end, but when FAU releases its first regular season depth chart it appears likely that Internicola could be the name listed at that position. Even if Internicola isn’t the starter, he will certainly play a significant role in the Owls’ defensive end rotation, which could go six deep and include true freshman Leighton McCarthy. BOCA RATON – Charlie Partridge said offensive lineman Reggie Bain offered an encouraging, even motivational, message to teammates who came to visit him in the hospital. The mission for FAU this week revolves around defeating Southern Illinois in Saturday’s season opener. Bain, a junior who started every game of his first two seasons at left tackle, won’t take part in that game and will likely miss the entire season following Friday afternoon’s traffic accident. According the Boca Raton Police, Bain was returning to campus on NW 13th street when, while crossing Glades Rd., a Toyota turning in the intersection struck Bain’s motor scooter. Bain was not wearing a helmet at the time of the accident. Despite the accident happening in close proximity to Boca Raton Regional Hospital, emergency crews transported Bain one town north to Delray Medical Center, which is known for its trauma unit. 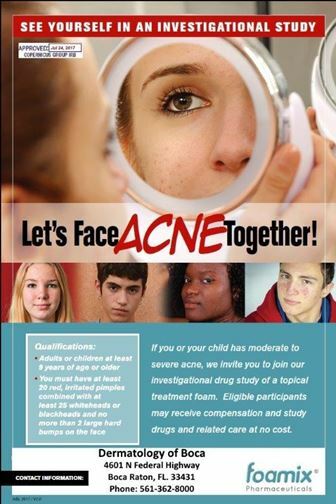 The Boca Raton Police representative did not know the extent of Bain’s injuries and, citing HIPAA laws, Partridge did not disclose those injuries during Monday’ weekly media conference – other than to reiterate that they were non-life threatening. “The most important thing is that he’s safe, he’s supported – from a big-picture standpoint he’s in a very good place,” Partridge said. Word of Bain’s accident spread quickly among teammates. Upon learning of the accident, Partridge says he headed to the hospital, as did many of the Owls. By the evening Partridge sent a group text to the team updating the players on Bain’s condition. Partridge said he visited Bain in the hospital on Friday, Saturday and Sunday. While the injuries will likely force Bain to miss the season, Partridge doesn’t expect them to be career ending. “We are very, very optimistic about that,” he said. Partridge says he gave the team another update on Bain’s condition prior to Saturday’s practice – a controlled situational scrimmage that he considered to be one of the best the Owls have experienced during his three-year tenure as coach. OwlAccess.com reported on Sunday that FAU will compensate for the loss of Bain by moving center Dillon DeBoer to Bain’s left tackle spot, sliding Roman Fernandez from left guard to center, and promoting Tarrick Thomas to the starting left guard spot – a realignment Partridge confirmed to the media on Monday. Welcome to the new OwlAccess.com. FAU football is primed for a breakout season in 2016. The way we see it, the new-look Owls deserved a site with a new, fresh look. With that in mind we set about giving OwlAccess.com its first overhaul since the site launched in 2009. With every aspect of this update, we constantly asked ourselves one question: Will this change make for a better user experience? In response to that question we’ve created a site that’s more photo friendly, allowing fans to get an even better look at the Owls. We’ve also made the site friendlier to videos, so FAU fans can expect to see more of them on OwlAccess.com. Aside from the newer, cleaner look, the biggest difference seasoned FAU fans will notice is that we’ve brought our message board into the new millennium. Now fans can better connect with each other, discussing the team they love. We expect the new message board to be a place for intelligent conversation about FAU sports – a venue where fans can interact with our writers, posing specific questions or posting their own opinions regarding the program or the university. Basically, fans can receive more of the news they crave directly from our insiders – the ones who know the program the best. 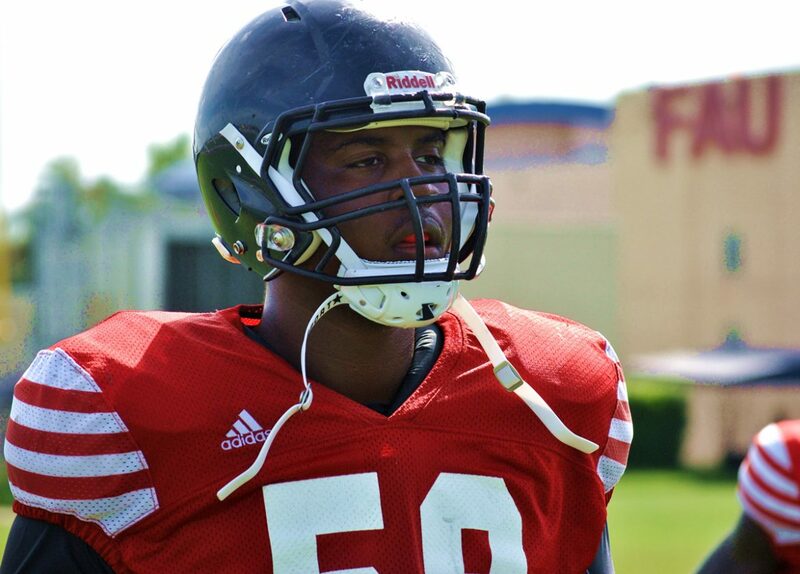 We’ve also added a couple of talented new writers who FAU fans will enjoy. Jake Elman and Matt Wilson will add insight and insider knowledge that FAU fans have come to expect from the premier FAU sports site. The OwlAccess.com redesign and upgrade couldn’t have happened without the input of many of you. For that we thank you. For those of you who are seeing the new look of OwlAccess.com for the first time, now is your chance to help shape the coverage. Over the coming days we expect to add even more functionality – especially to the message board. If you come across a problem or have a suggestion for another feature or two you’d like us to add, please either post the ideas on the message board or send us an email at info@fauowlacces.com. We hope you enjoy the new OwlAccess.com. Now, let’s get back to football season. Are you ready for some FAU football? 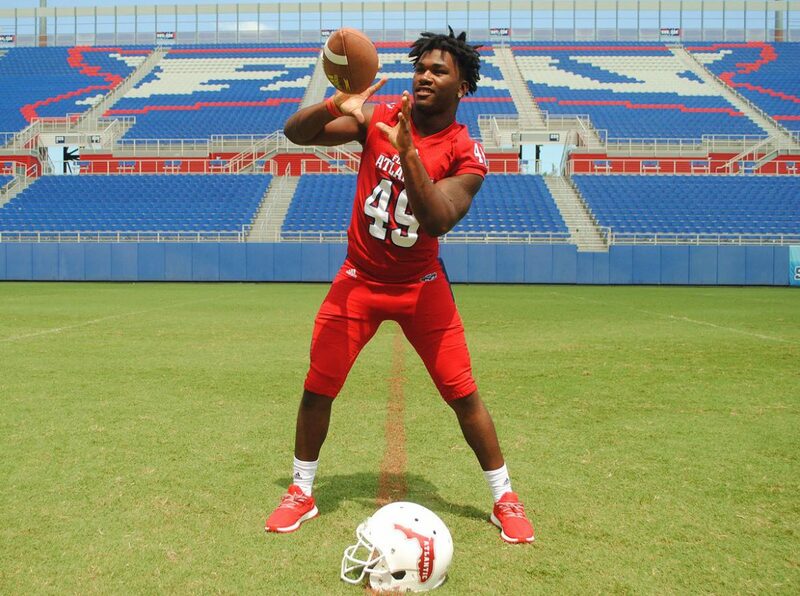 BOCA RATON – A traffic accident that happened on Friday will likely cost Preseason All-Conference USA offensive tackle Reggie Bain his season, FAU announced on Sunday. At 6-foot-4 and 290 pounds, FAU coaches consider Bain to be one of their most intelligent linemen. A starter since he set foot on campus, Bain has yet to use his redshirt year. 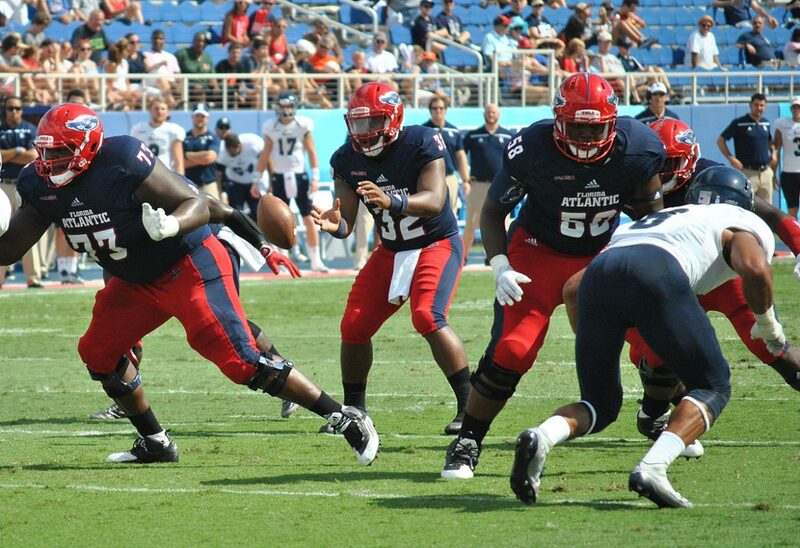 To compensate for the loss of Bain, FAU will do some shuffling along its offensive line. Center Dillon DeBoer will slide to left tackle, his more natural position. Roman Fernandez will move from left guard to center. Redshirt freshman Tarrick Thomas will replace Fernandez as a starting guard. DeBoer moved to center before the start of last season when Fernandez, then the starting center, began suffering from concussion-like symptoms. Fernandez would ultimately miss the entire season. DeBoer’s move solidified the offensive line last season. Coaches have raved about DeBoer’s performance at center this fall. Thomas continued the progress he made in a strong spring and was already expected to see playing time this season. Byers Hickmon emerged from spring football as the Owls’ third tackle, behind Bain and right tackle Kelly Parfitt, but he missed nearly all of fall camp with an undisclosed issue. He rejoined the team, practicing this past week but it will likely take the redshirt sophomore some time to return to game shape. Redshirt freshman Bryan Beck joined Hickmon as the second-team tackles. Last week FAU used a true freshman, 6-foot-5, 300-pound Brandon Walton as a second-team tackle. Redshirt freshman Richard Williams remains the Owls’ backup center. The Owls could also elect to shift a current starter, potentially center Dillon DeBoer, to tackle – a position he has played before. BOCA RATON – FAU athletic director Pat Chun’s plan to compensate for decreased television revenue centers around a premise that Owls fans will will surely embrace – winning. Like most schools in Conference USA, FAU expected revenue generated from the conference’s television deals to be cut in half. But instead of dropping from about $1 million to about $500,000 per school each season, a depressed television market prompted that number to fall to $200,000. Chun believes FAU can help make up for that expected shortfall with increased attendance on game days. Winning football, Chun believes, is one of the factors that will drive an attendance increase this season. Early victories over the likes of FCS opponent Southern Illinois in the Sept. 3 season-opener and Ball St. at home three weeks later would give FAU momentum heading into Conference USA play – something the Owls have never experienced. FAU is banking on the idea that momentum will translate into dollars. “We’re excited to see what competitive football in our stadium does to impact our local marketplace in the last half of our season,” Chun said. It is also hoped that later start times will lead to increased attendance. Gone are the early-to-rise-and-cook-in-the-sun noon starts. FAU’s home games will kickoff at either 3:30 p.m. or 6 p.m.
“Having more evening games is going to help us with students because, not just Florida Atlantic University but also across this country, the noon game is struggling for attendance,” Chun said. Later kick-offs are expected to continue a trend of increased student attendance. “Our biggest piece of optimism is, the biggest driver for college football games are college kids coming,” Chun said. “For the third year in a row we had an uptick in student attendance – I don’t know how many schools in the country can say that. As long as our students come they provide the environment that makes it really fun and festive. I’m interested to see, I think a lot of us are interested to see, the impact of playing really competitive football in that month of November.” Chun said. Some of last year’s student attendance increase can be attributed to the sold out game against Miami, so the Owls’ ability to continue the increased student attendance trend without a marquee opponent poses a challenge. An athletic department spokesman said the university does not know how much revenue the average attending fan brings to FAU, be it a student or someone else from the community, making it difficult to determine how many extra fans need to attend FAU games over the course of the season to make up for the lost television revenue. One positive factor for the FAU budget is that the Owls completed their buy-in to Conference USA last fiscal year, removing a $500,000 obligation from the books for this year. Still, the Owls will have to see whether they can play winning football in Boca Raton, and if they do win it, will fans come? “The combination of better kickoff times, the quality of football program that we’ll field, our students coming out creating the atmosphere that we need – our team needs and that makes it more entertaining for our fans and families to come watch us – should create an interesting November for us,” Chun said.BOCA RATON – FAU athletic director Pat Chun’s plan to compensate for decreased television revenue centers around a premise that Owls fans will will surely embrace – winning. An athletic department spokesman said the university does not know how much revenue the average attending fan brings to FAU, be it a student or someone else from the community, making it difficult to determine how many extra fans need to attend FAU games over the course of the season to make up for the lost television revenue. FAU averaged an announced attendance of 17,617 during it six home games last season. 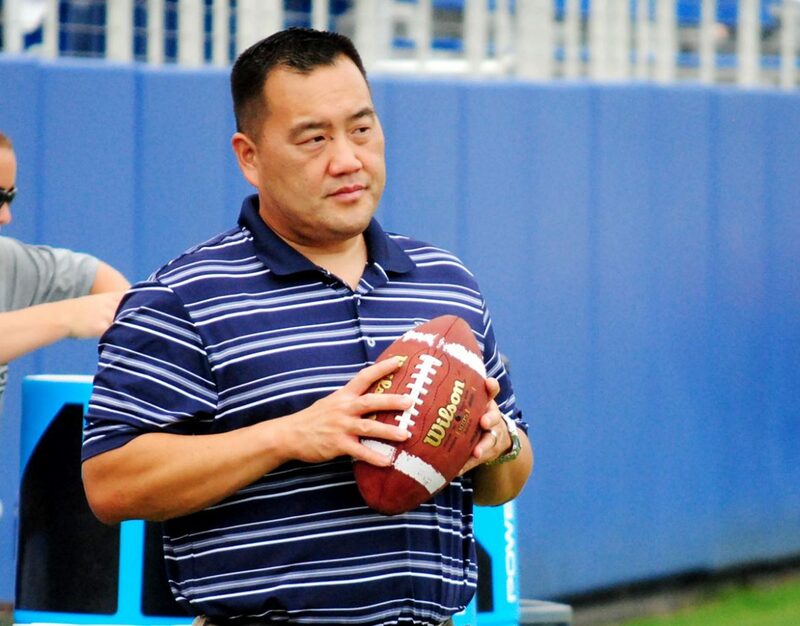 “The combination of better kickoff times, the quality of football program that we’ll field, our students coming out creating the atmosphere that we need – our team needs and that makes it more entertaining for our fans and families to come watch us – should create an interesting November for us,” Chun said. BOCA RATON – After a quiet freshman season where injuries limited his play, sophomore Khantrell Burden is preparing for FAU’s Sept. 3 kickoff against Southern Illinois as a first-time starter on the Owls’ defense. Talking to the second-year linebacker, though, it’d be easy to mistake him for someone who started the majority of the Owls’ 2015 season. “There’s no pressure at all, no anxiety,” Burden said. A sophomore, Burden certainly has left many of the frustrations of an injury-filled freshman year behind him – doing so at an important time for FAU linebacker unit. The Owls expected to have starter Robert Relf, who missed nearly all of 2015 because of a shoulder injury, return to his starting strong side linebacker only to announce prior to camp that injuries prematurely ended Relf’s career. The loss of Relf placed a greater importance on Burden’s development. He’s rising to the challenge. Having played last season at a listed weight of 205, Burden said that he bulked up to roughly 220 pounds. This puts him at a comparable size to fellow starting linebackers Azeez Al-Shaair (220 pounds) and Nate Ozdemir (230 pounds). Increasing his durability – a preseason knee injury followed by a late-season concussion limited his availabilty last season – and ensuring he was on the field as much as possible was not only a goal for Burden himself, but also for Partridge and the coaches. Burden’s rapid development has helped solidify what was a shallow and untested linebacker unit last season, making it a group that is becoming increasingly more formidable. His improvement will allow FAU to employ its base 4-3 defense more frequently this season, whereas last year the Owls often defaulted to a nickel package that replaced one of the linebackers with a defensive back. Burden credits former Florida Atlantic cornerback Cre’von LeBlanc, now in the NFL with the New England Patriots, with helping him adjust to college football. One year later, Burden is comfortable enough with his role that he’s becoming a mentor. Burden is trying to do exactly that with true freshman Rashad Smith, who begins the season as Burden’s backup. The coaching of third-year defensive coordinator/linebackers coach Roc Bellanton, in Burden’s eyes, also has helped bring the group closer together. BOCA RATON – Henry Bussey wants to put his name in the FAU record book. The way special teams coach Chris Hurd sees it, Bussey has the make-up to become the first FAU player ever to return a kickoff for a touchdown. A junior, Bussey will be given the opportunity to follow in the footsteps of former FAU returner Lucky Whitehead, now with the Dallas Cowboys. Whitehead’s straight-line speed and explosive change of direction made him a threat to take any ball he touched to the end zone. Bussey, who both stylistically and physically resembles Whitehead, brings similar talents to the field. Bussey, who came to FAU as a running back before moving to wide receiver, says the skills he developed at both positions translate well into kick returning. “I use my vision and read my blocks,” he said. Bussey has shown flashes of being a game-changing special teams performer. His 40-yard return last season was only four yards shy of Cre’von LeBlanc’s 44-yard burst for longest of the season. Players with the potential Bussey poses inspire in teammates a belief that something special could happen at any moment. That’s not a common situation at FAU, where historically the special teams haven’t been all that special. Whitehead’s 75-yard burst in 2014 against Old Dominion is the only Owls punt return touchdown in their FBS era. The Owls spent part of fall camp tying to identify a punt returner to replace the departed LeBlanc and Jenson Stoshak. Wide receiver Tony Thomas is the only Owl on the current roster who returned a punt last season, doing so once who for a loss of a yard. Owls coaches are closely guarding their return options, but Bussey is in the mix to field punts, as are Jalen Young, Ocie Rose and, recently, James Brunson. Rose, Marcus Clark and Kamrin Solomon join Bussey as expected members of the kick return team. BOCA RATON – Lass than 24 hours after specifying that Jason Driskel won FAU’s quarterback battle, Owls’ coach Charlie Partridge declined to offer many specifics regarding why he made that decision. Meeting with reporters following Wednesday’s practice, Partridge consistently returned to the phrase “game ready” when discussing the choice Driskel over Daniel Parr. What makes a quarterback game ready? Driskel played in 10 games last season in relief of injured quarterback Quez Johnson, starting two. He completed 77 of 151 passes for 965 yards and three touchdowns. He also ran for another score and tossed four interceptions. He’s the younger brother of Jeff Driskel, who started for the University of Florida before transfering to Louisina Tech. Parr, a redshirt freshman, is one of the highest profile players ever to enroll at FAU, choosing the Owls over Miami. FAU didn’t make either player available to the media on Wednesday and dictated that neither player will be accessible to reporters until next Wednesday, which is the normally scheduled day for offensive players to speak with the media during game weeks. Throughout camp Partridge had said he intended to name a starting quarterback before the Owls began game preparation for their Sept. 3 opener against Southern Illinois. Partridge and offensive coordinator Travis Trickett informed Driskel and Parr of their decision Tuesday evening. Partridge says he simultaneously informed both players the decision. “They both reacted the way you’d want quarterbacks to react, which is with poise, dignity and a competitive spirit,” Partridge said. If there was one event or characteristic that allowed Partridge to know it was time to formalize the decision, he didn’t reveal that, either. “Because we were ready,” was the only explanation Partridge offered to the timing of the decision. 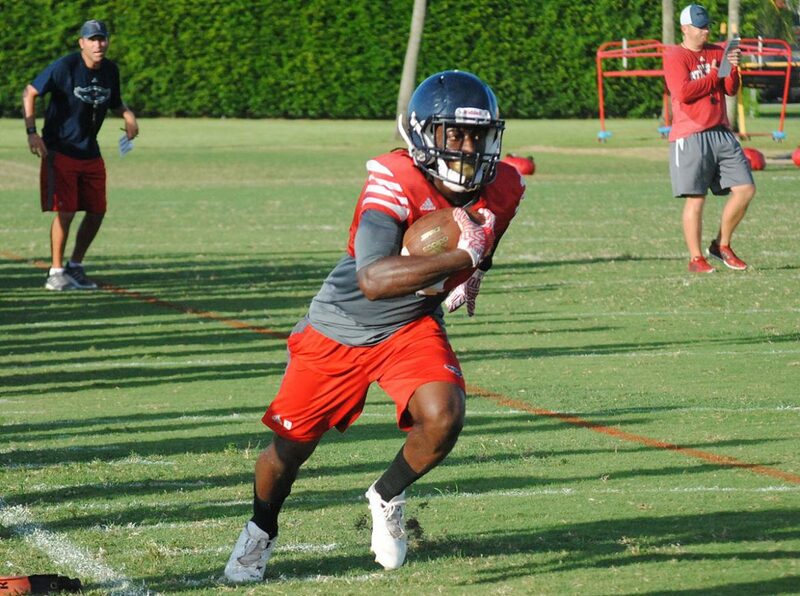 Wednesday marked the conclusion of FAU’s fall camp, with the Owls emerging reasonably healthy. Linebacker Jake Stewart, primarily a special teams performer, is expected to miss the season because of a knee injury, Partridge announced. He’ll join defensive tackle Ray Ellis (knee, out for the season) and tight end Dustin Bowens (chest, likely to miss first few games) as the only players expected to contribute to this season who will miss significant time. The Owls intend to apply the Southern Illinois game plan to first and second down situations during Thursday’s practice, with third down and red zone specifics coming on Friday. FAU will hold a closed scripted scrimmage on Saturday and continue game week prep on Sunday. That is, of course, weather permitting. Partridge met with director of football operations Heather Henderson prior to Wednesday’s practice for what he termed a “quick debrief” regarding the tropical disturbance in the Atlantic which some forecasts predict threaten South Florida this weekend, though with varying degrees of severity. 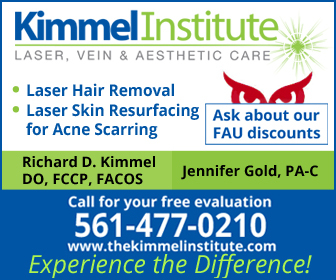 BOCA RATON – Jason Driskel won the battle. 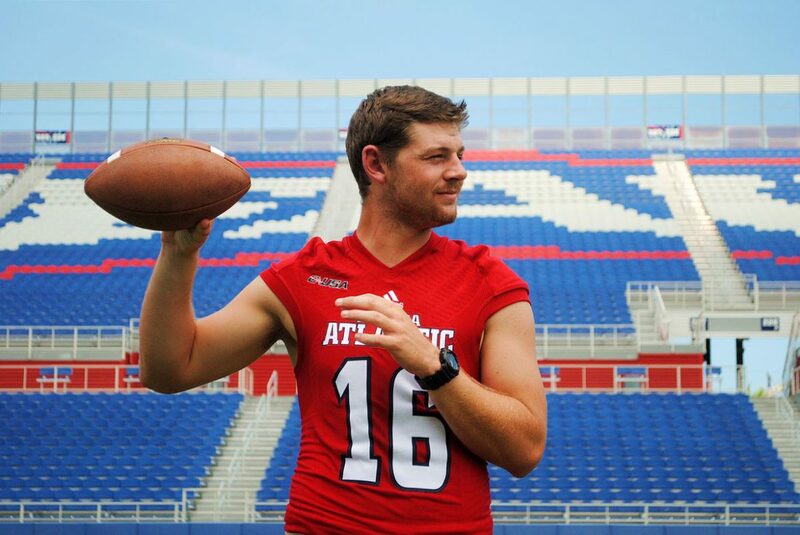 The redshirt sophomore beat out Daniel Parr, a redshirt freshman, in competition to be FAU’s starting quarterback in the Sept. 3 season-opener against Southern Illinois. 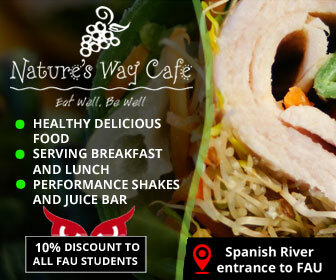 FAU curiously announced the decision in a press release. Partridge did not elaborate further as to why he chose Driskel over Parr, but Driskel did appear to be the more consistent quarterback over the past couple of weeks. Driskel played in 10 games last season in relief of injured quarterback Quez Johnson, starting two. He completed 77 of 151 passes for 965 yards and three touchdowns. He also ran for another score and tossed four interceptions. Parr was one of the most acclaimed recruits ever to sign with FAU, enrolling in January of 2015 after spurning a late push from Miami. The quarterback battle was the first true competition since Partridge took over at FAU. FAU concludes fall camp on Wednesday, switching to Southern Illinois prep on Thursday.